A protein newly found in the naked mole rat may help explain its unique ability to ward off cancer. The protein is associated with a cluster of genes (called a locus) that is also found in humans and mice. It’s the job of that locus to encode—or carry the genetic instructions for synthesizing —several cancer-fighting proteins. As Professor of Biology Vera Gorbunova explains, the locus found in naked mole rats encodes a total of four cancer-fighting proteins, while the human and mouse version encodes only three proteins. The findings by Gorbunova, Assistant Professor of Biology Andrei Seluanov, and their research team have been published in the Proceedings of the National Academy of Sciences. It had already been known that the genes in question—referred to as INK4 gene locus—synthesize the same three cancer-suppressing proteins in both species: p15INK4b, p16INK4a, and ARF, all of which stop cells from dividing when the cells are stressed or mutated. 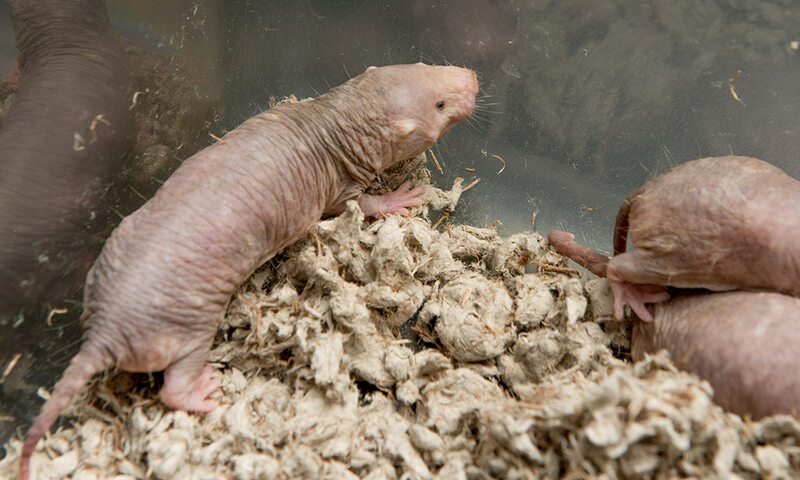 A student-researcher, Jorge Azpurua, wanted to clone the p16 protein of the naked mole rat for a separate experiment and noticed something unexpected: The presence of a fourth protein, which was the result of p15INK4b and p16INK4a being fused together. This fourth protein was as good or even better than p15INK4b and p16INK4a at stopping cells from dividing. Naked mole rats are small, hairless, subterranean rodents that have never been known to get cancer despite having a 30-year lifespan. Previous research by Seluanov and Gorbunova identified HMW-HA as the chemical that activates the anti-cancer response of the INK4 locus. “INK4 is the most commonly mutated gene locus in the human cancer,” said Seluanov. “When that gene is deleted or silenced, it often results in the formation of tumors.” And, as he pointed out, there is growing evidence to support its role in atherosclerosis and other aging-related diseases. In order to determine the significance of pALTINK4a/b, the researchers examined the expression of the proteins under different cell growth conditions. They found that the presence of the hybrid protein does increase when cells become crowded, as long as HMW-HA is present. On the other hand, when HMW-HA was removed, pALTINK4a/b was not expressed, but it was also induced by a variety of stresses such as oncogenes, which have the potential to cause cancer. The researchers concluded that the protein does respond to high-cell density and to HMW-HA, which initiates the anti-cancer response of the INK4 gene. The presence of the fourth INK4 protein, pALTINK4a/b, makes naked mole rats more likely to arrest growth when there is a risk of malignancy, compared to other mammals that have only three proteins encoded by INK4 locus. In an effort to determine whether pALTINK4a/b is also found in mice and humans, the researchers tried to screen mouse and human cells and tissues for the protein hybrid, but were unsuccessful. “While our work doesn’t eliminate the possibility that the protein exists under some conditions in mice and humans, the results suggest that it’s highly unlikely,” said Gorbunova. The research team also included Adeline Augereau and Vadim Gladyshev of Brigham and Women’s Hospital at Harvard University, Zhengdong Zhang and Jan Vijg of Albert Einstein College of Medicine, and Jorge Azpurua and Zonghe Ke of the University of Rochester.